Hello all, welcome to my small corner of the world. I wanted to share my workspace with everyone. 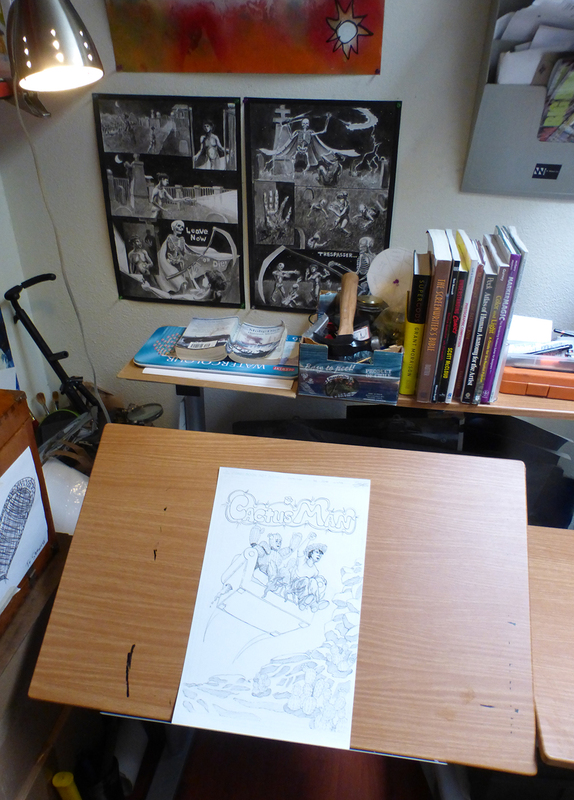 Having a proper drafting table is a new development in my career. It makes things a lot easier and more organized. And it makes me feel like a real artist, with a studio on par with the professionals. I’ll also show off some of the quirky things going on. Here is my area. Most of the wall is covered in books. Not a good place to be in an earthquake, but I think I could duck under the desk if need be. Who ever heard of an earthquake in the bay area anyway? 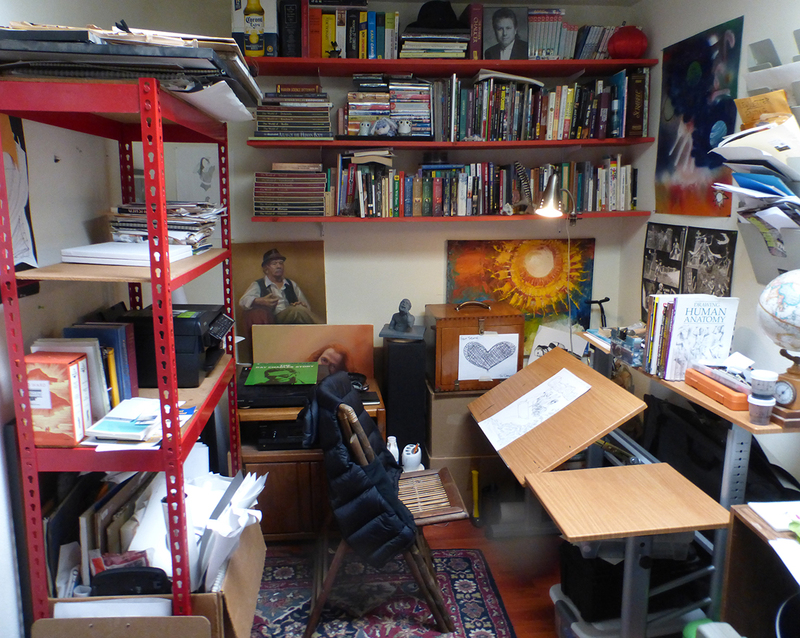 Living in a small place (converted two car garage), and being very poor, means that you need to be creative with your use of space. I try to use as much of the height of the room as possible, plus stashing things all over. It would be easier to just get a bunch of storage solutions from ikea, but I’m much too cheap for that. Most of my money has to go to food and drawing paper. The desk was a Christmas present, and it functions very well. The tilt up table is great for saving your wrist when you draw for hours at a time. In this picture you can see two of my most recent projects. 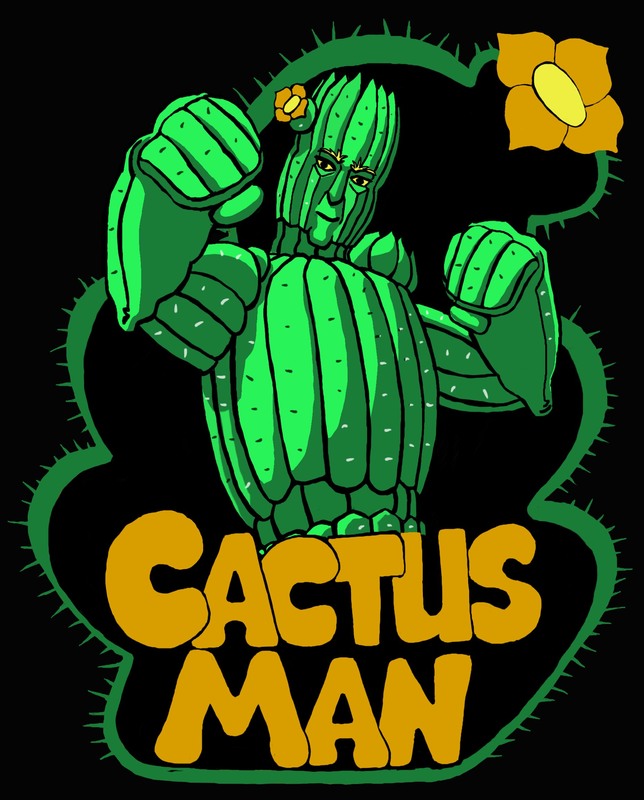 On the table is the preview for my upcoming project Cactus Man. On the wall is my anatomy class final. I like to keep things where I can see them, cause it helps you avoid the mistakes you made with the last project. Get this. 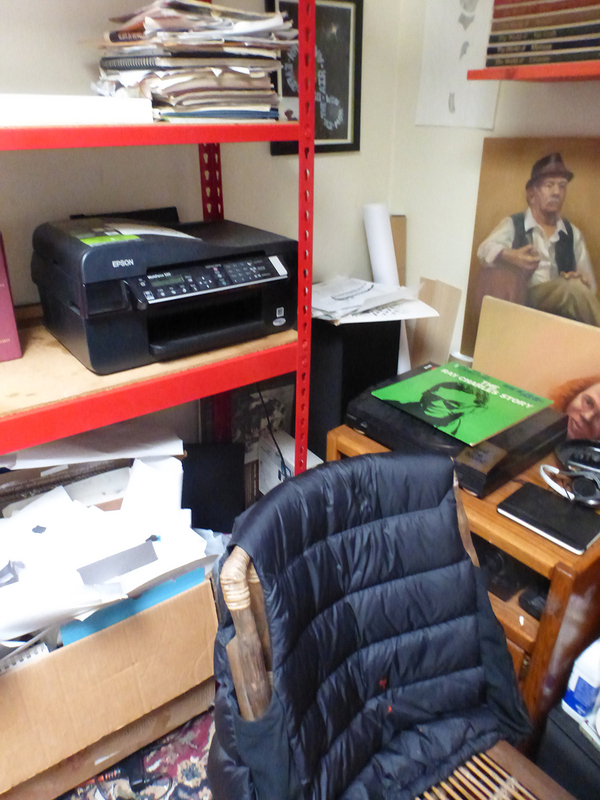 That red shelving unit, as well as the scanner, were both rescued from a street corner near my house. I’d spent months looking for cheap shelves, and then I found these, and you can’t get cheaper than free. The folding chair covered with an old down vest? Also free, thanks for asking. You can see theres a running theme throughout this post. You have to have instruction books. Most of these I paid for. The Scott McCloud book is mandatory reading for anyone who does comics. 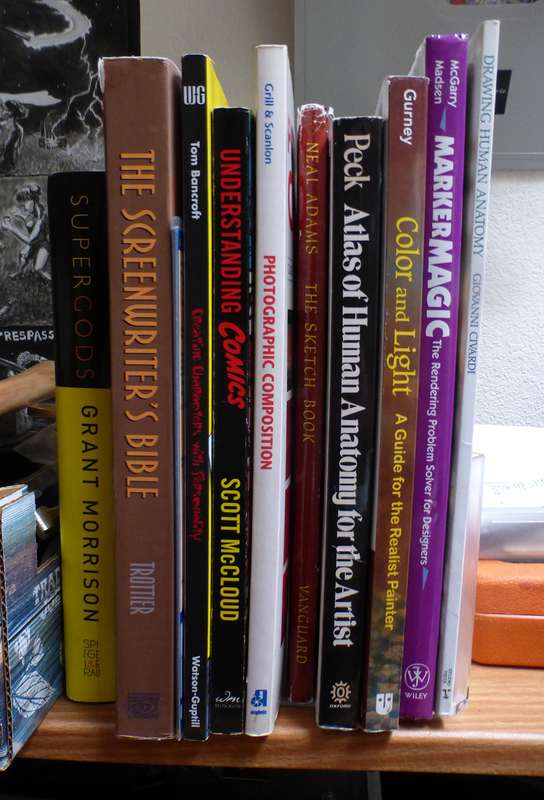 The best book here is Color and Light, by James Gurney. I can’t say enough good things about James Gurney, because he is a genius, and one of the main influences on me as an artist. 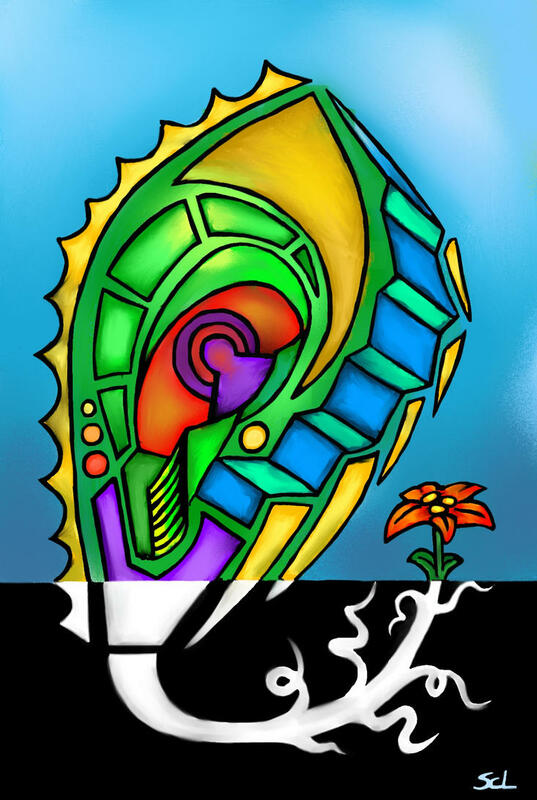 I don’t know if anyone would be interested in book reviews, but I’d be happy to do it. If anyone is interested, let me know in the comments. Gotta have tools. 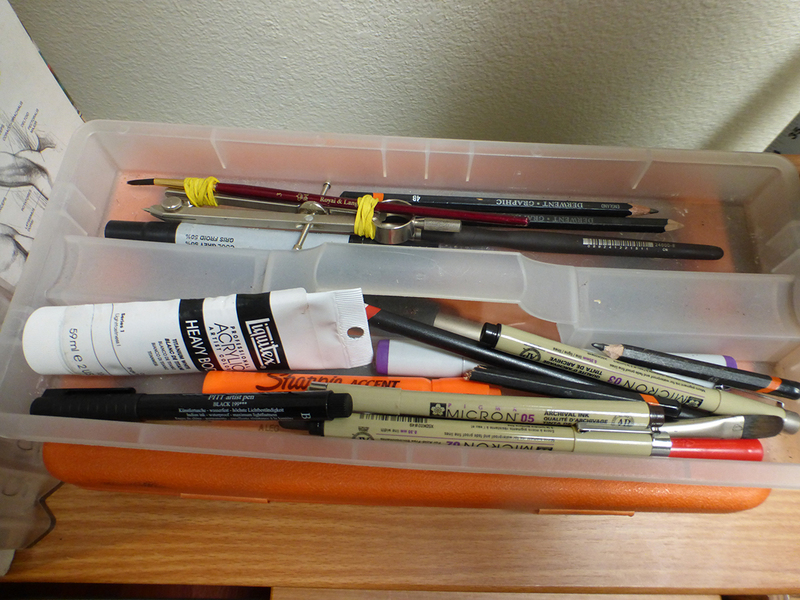 Pens, pencils, markers, acrylic paint for white out. Have you ever hooked an ink brush up to a compass? Its the best. It may be inking with training wheels on, but damn it I like training wheels! They keep you from falling on your face. 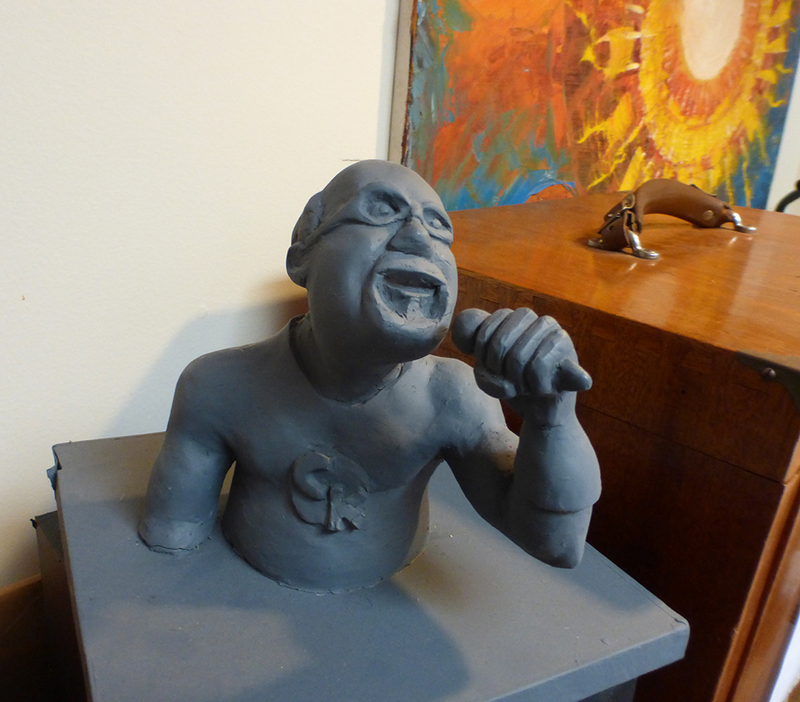 A maquette of Louis CK as one of the Incredibles characters? Yeah, I’ve got that. Don’t ask me why. On the wall behind is my favorite painting. Its by my grandmother, who is a brilliant abstract expressionist painter. This painting has followed me everywhere I go since she painted it for me in 1991. Grandma’s painting is the only thing that’s NFS, although I will sell you the folding chair covered with an old down vest. Lets try to keep it civil though, I don’t want the bidding to get too heated. 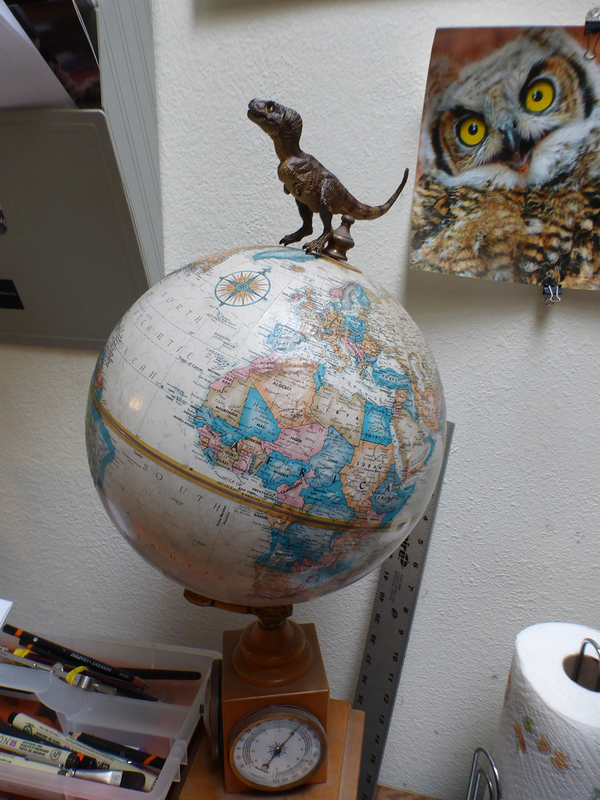 The T-Rex stands on an unfamiliar globe. These are not the continents he knows. His cold reptilian heart whispers that too much has changed. Tearfully, the outcast turns his face skyward, hoping the moon will give him refuge in its lunar permanence. We all need to have our own place in the world. Mine may be small and cluttered, but hey, at least it was free.